Toronto, ON – November 28, 2017 – Rockcliff Metals Corporation (“Rockcliff“ or the “Company”) (TSX.V: RCLF) (FRANKFURT: RO0, WKN: A2H60G) is pleased to announce that the Company, through its 100% owned subsidiary, Goldpath Resources Corp., has purchased a 100% interest in the Lucky Jack Gold Property, located in the historic Wekusko-Herb Lake gold camp in Snow Lake, Manitoba. The Lucky Jack Gold Property totals 15 mining claims covering 2,557 hectares and is located immediately south of the Company’s Laguna Gold Property which hosts the former producing Laguna Gold Mine, Manitoba’s first and highest-grade gold mine. The Lucky Jack Gold Property becomes part of the Company’s Manitoba property portfolio, one of the highest-grade base and precious metals property portfolios in North America. The Company’s property portfolio is in the Snow Lake mining camp located within the prolific Flin Flon-Snow Lake greenstone belt hosting high-grade precious and base metal deposits and mines. Please refer to Figure 1 on the following page for Lucky Jack Gold property highlights. At the Lucky Jack Gold Property, gold mineralization is hosted in foliated and fractured zones and sulphide bearing quartz veins and stringers located near the contact of granite, granodiorite and pegmatite rocks with the surrounding volcanic, intrusive and sedimentary rocks. Geophysical evidence suggests that gold mineralization is associated along the contacts of multi-kilometre long magnetometer anomalies and that at least 6 magnetometer anomalies have been identified within the Lucky Jack Gold Property. Limited historical work has been completed at the Lucky Jack Property. A main shaft was sunk in 1924 on a quartz vein system 1,000 metres long and up 15 to 25 metres wide, as documented by the Mineral Inventory of Manitoba (J.D. Bamburak-1980). A total of 21 grab samples from the main shaft area were reported to have averaged 66.0 grams per tonne(g/t) gold. In 1982, channel samples completed by Cangold Ltd. near the main shaft assayed from 11.0 gpt across 0.4 metres to 44.2 g/t gold across 1.4 metres and gold values were recorded over a strike length of 130 metres. In 1988, drilling completed by Granges Exploration Ltd. around the main shaft area intersected significant gold assays including in Hole # BAR-3 of 8.9 g/t across 1.0 metres, 15.9 g/t across 1.0 metres, 19.6 g/t across 0.5 metres and 32.5 g/t across 0.5 metres above 75 metres vertical. In 1985, one drill hole (KUS169) completed by Hudbay Minerals Inc. on a separate gold-rich system 1.7 kilometres west of the main shaft intersected gold values above 75 metres vertical of 5.6 g/t across 0.3 metres, 11.5 g/t across 0.46 metres and 58.5 g/t across 0.40 metres. A third area of gold potential 5.5 kilometres northwest of the main shaft intersected a gossan-rich zone 5 to 10 metres wide with samples up to 20.6 g/t gold. Rockcliff purchased 100% of the Lucky Jack Gold property for $77,250 and a 2% net smelter royalty (NSR) on seven of the fifteen claims. Half of the NSR can be purchased at any time for $500,000 per 0.5% NSR. Rockcliff has the right of first refusal on the remaining NSR on the property. Toronto, ON – November 1, 2017 – Rockcliff Metals Corporation (“Rockcliff“ or the “Company”) (TSX.V: RCLF) (FRANKFURT: RO0, WKN: A2H60G) is pleased to announce the commencement of a phase one drill program on the Bur Zinc Property. The drill program is planned to include between 10 to 15 holes totalling approximately 3,000 metres and will focus on expanding the high grade Volcanogenic Massive Sulphide (VMS) Bur Zinc Deposit. The Bur Zinc Property is part of the Company’s Manitoba property portfolio and is located approximately 22 kilometres by road from Hudbay Minerals Inc.’s (“Hudbay”, HBM:TSX;NYSE) copper-zinc concentrator centred in the Snow Lake mining camp within the prolific Flin Flon-Snow Lake Greenstone Belt located in central Manitoba. Historical estimates of grade and tonnage given in this press release are viewed as reliable and relevant based on the information and methods used at the time. They were prepared in compliance with resource definitions under NI 43-101 but must be considered only as historic resources as the Bur Deposit Report was prepared for Hudbay in 2007. Neither Rockcliff nor its Qualified Persons have done sufficient work to classify the historic estimate as a current mineral resource under current mineral resource or mineral reserve terminology and are not treating the historic estimate as a current mineral resource. The historic resource should not be relied upon. Additional work including surface geophysics, drilling and bore-hole geophysics will need to be completed to upgrade the historical resource to current. Toronto, ON – April 26, 2017 – Rockcliff Copper Corporation ("Rockcliff" or the "Company") (TSX VENTURE:RCU) (FRANKFURT:RO0) (WKN:A142TR) is pleased to announce the drill hole assay results from its recently completed Phase 2 drill program on the Talbot Property ("Property"), Manitoba. The Property forms part of Rockcliff's Snow Lake Project centered on the Snow Lake Mining Camp, Manitoba, Canada. 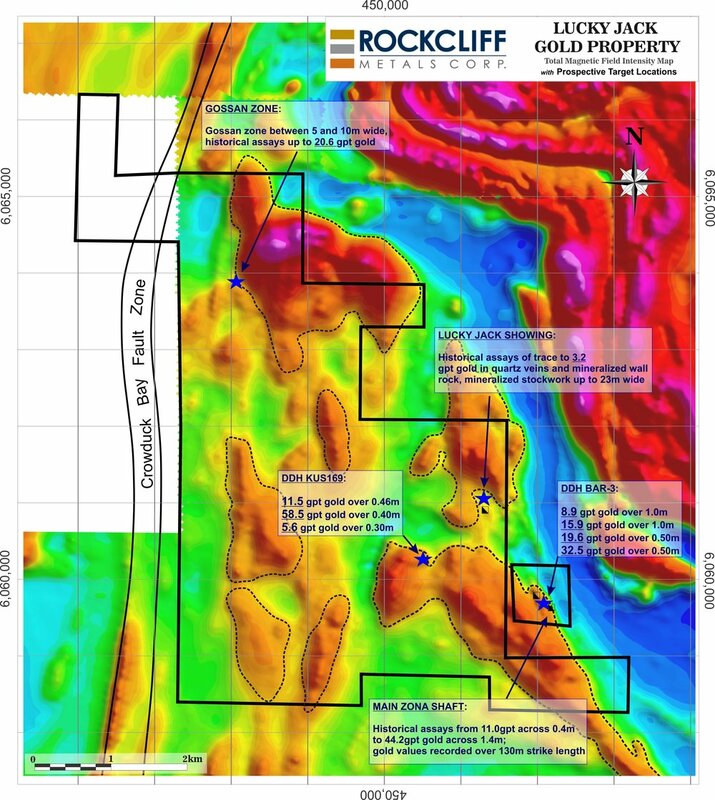 Rockcliff President and CEO commented, "This important early stage VMS discovery, initially identified as a high priority geophysical conductive plate, hosts significant concentrations of copper, gold, zinc and silver. The Talbot property also hosts the nearby high grade gold-rich Talbot copper deposit which was historically identified as two separate high priority geophysical conductive plates. Most large VMS mines in the Flin Flon-Snow Lake mining camp are comprised of multiple stacked VMS-rich lenses that were identified initially as geophysical conductive plates and the Talbot property appears to have those same attributes. Further drilling is planned in 2017 to define the Plate's significant economic potential." Drill hole assay results from the Company's completed Phase 2 drill program are tabled below. Notes(m) = metres represents down the hole thickness as true thickness is not currently known, % = percentage, g/t = grams per tonne, *copper equivalent value used US$2.50/pound copper, US1300/ troy ounce gold, US$1.15/pound zinc and US$20 /per ounce silver, 100% metal recoveries were applied, copper equivalent calculation is: CuEq = Cu grade + ((Zn grade%/100 x Zn price) + (Au grade gpt x Au price/gram) + (Ag grade gpt x Ag price/gram))/Cu price x 100. The numbers may not add up due to rounding. TB019 was press released on April 6, 2017. 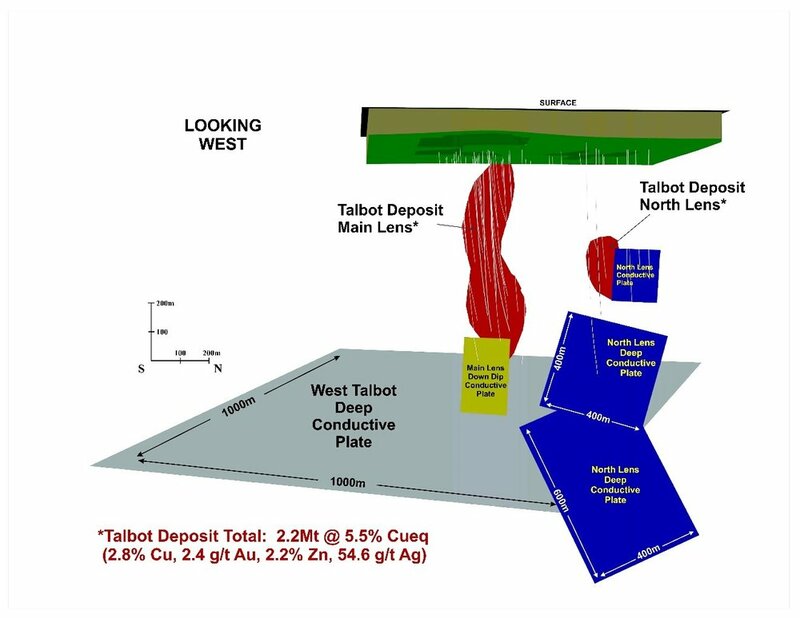 A preliminary 3D longitudinal section of the Talbot deposit area highlighting the known nearby conductive plates and location of discovery drill hole TB-019 and step out drill hole TB-020 are shown below. *Please review the high grade gold-rich Talbot copper deposit NI 43-101 Resource estimate on the following page for additional information. Drill hole TB-019 tested the very top edge of the Plate located below the Talbot deposit north lens. Step out drill hole TB-020 tested the Plate approximately 250 m below drill hole TB-019. Both holes intersected gold-rich VMS mineralization termed the North Lens Deep Zone. Additional down-the-hole geophysics confirmed that the conductivity below the VMS mineralization intersected in drill hole TB-020 strengthened below the hole. The Plate measured approximately 400 m by 1000 m.
Drill hole TB-019 was drilled at UTM NAD83 co-ordinates 458634E/5997410N, to a depth of 926 m, along an azimuth of 285 degrees, and a dip of -70 degrees. Drill hole TB-020 was drilled at UTM NAD83 co-ordinates 458775E/5997350N, to a depth of 1160 m, along an azimuth of 285 degrees, and a dip of -73 degrees. On February 4, 2016, Rockcliff announced on the Property an Inferred Mineral Resource as set out in the National Instrument 43-101 – Standards of Disclosure for Mineral Projects (“NI 43-101”) technical report dated January 25, 2016 and titled “Technical Report on the Talbot Property, Manitoba, Canada” (the “Technical Report”), a copy of which is available on the Company’s SEDAR profile at www.sedar.com, in respect of an initial Mineral Resource Estimate prepared by Roscoe Postle Associates Inc. (“RPA”) for the Talbot deposit located on the Talbot Property, central Manitoba. Rockcliff is a Canadian resource exploration company focused on the discovery, advancement and consolidation of the highest grade unmined metal deposits in the prolific Flin Flon – Snow Lake (FF-SL) greenstone belt specifically centered on Snow Lake, Manitoba, Canada. The Snow Lake Project, totalling in excess of 45,000 collective hectares is located in and around the Snow Lake mining camp and hosts the highest grade unmined NI 43-101 copper deposits (the gold-rich Talbot copper deposit and the Rail copper deposit), and the highest grade unmined historical zinc deposits (the Lon zinc deposit, the Bur zinc deposit, the Morgan zinc deposit and the down dip continuation of the Pen zinc deposit). The Snow Lake Project also includes a high grade former lode gold producer (Laguna gold property), a Net Smelter Royalty (NSR) on the Tower property (the T-1 copper deposit) and the near surface MacBride zinc deposit located north of Snow Lake near Leaf Rapids, Manitoba. Additionally, Rockcliff owns a zinc-silver rich NI 43-101 Resource (the Shihan deposit) in Ontario and a royalty on two gold properties in Colombia, South America. Toronto, ON – March 21, 2017 – Rockcliff Copper Corporation (“Rockcliff” or the “Company”) (TSX.V: RCU) (FRANKFURT: RO0, WKN: A142TR) is pleased to announce that its recently completed surface geophysical survey has identified a large untested conductive plate below the historical Pen Zinc Deposit that is partially located on the Company’s 100% owned Penex zinc property (the “Property”), Snow Lake, Manitoba. The Property is strategically located approximately 4.5 kilometres southwest of Hudbay Minerals Inc.’s (“Hudbay”) high-grade Volcanogenic Massive Sulphide Lalor mine and less than 200 metres from Hudbay’s up-dip near surface portion of the historic high grade unmined Pen zinc deposit. The Property hosts the down dip continuation of the Pen zinc deposit and is part of the Company’s Snow Lake Project, one of the highest grade base and precious metals property portfolios in North America. The high grade Pen zinc deposit hosts multiple zinc-rich lenses, strikes northeast-southwest and dips/plunges northwest. The deposit is located less than 200 metres on surface from the Property’s southern boundary. All lenses of the Pen zinc deposit dip towards the Property’s southern boundary and at least one of the zinc-rich lenses dips and plunges onto the Property at a vertical depth of between 300-350 metres. The deepest historical drill hole (CPen-03) on the Property intersected the deposit at approximately 475 metres vertical. The hole assayed 6.7% zinc equivalent across a down the hole thickness (not true thickness) of 2.6 metres within a much thicker zinc envelope of a down the hole thickness (not true thickness) of 7.6 metres grading 4.0% zinc equivalent. Bore hole geophysics completed in drill hole CPen-03 and now in surface geophysics have confirmed that the deposit’s conductivity continues downward on the Property below the hole and was strengthening at depth where the deposit remains untested by drilling. The following Pen zinc deposit longitudinal section outlines the depth potential of the Pen zinc deposit above and below drill hole CPen-03. Rockcliff is a Canadian resource exploration company focused on the discovery, advancement and consolidation of the highest grade unmined metal deposits in the prolific Flin Flon – Snow Lake (FF-SL) greenstone belt specifically centered on Snow Lake, MB. The Snow Lake Project, totalling in excess of 45,000 collective hectares is located in and around the Snow Lake mining camp and hosts the highest grade unmined NI 43-101 copper deposits (the gold-rich Talbot copper deposit and the Rail copper deposit), the highest grade unmined historical zinc deposits (the Lon zinc deposit, the Bur zinc deposit, the Morgan zinc deposit and the down dip continuation of the Pen zinc deposit). The Snow Lake Project also includes a high grade former lode gold producer (Laguna gold property), a Net Smelter Royalty on the Tower property (the T-1 copper deposit) and additional properties with precious metal and VMS potential. Located near Leaf Rapids, Manitoba, Rockcliff owns the near surface MacBride zinc deposit. Additionally, Rockcliff owns a zinc-silver rich NI 43-101 Resource (the Shihan deposit) in Ontario and a royalty on two gold properties in Colombia, South America. Toronto, ON – March 6, 2017 – Rockcliff Copper Corporation (“Rockcliff” or the “Company”) (TSX.V: RCU) (FRANKFURT: RO0, WKN: A142TR) is pleased to announce that a Phase one geophysical program has commenced at the Company's high grade Laguna gold property (the "Property"), in Manitoba. The Company will complete an airborne magnetometer survey over the entire Property using state of the art drone airborne equipment and complete an Induced Polarization (IP) survey to cover the prospective high grade Laguna gold mine trend. The Property hosts the former high-grade Laguna gold mine and is part of the Company's Snow Lake Project, one of the highest grade base and precious metals property portfolios in North America. The Snow Lake Project is located in the Snow Lake mining camp in the eastern half of the prolific Flin Flon-Snow Lake greenstone belt which hosts numerous high grade precious and base metal deposits and mines. Ken Lapierre President & CEO stated "Our geophysical program is the first program of its kind ever on the Property. Last year's initial prospecting program over historic showings identified significant, widespread gold values from trace up to 20 ounces per tonne. More importantly it discovered that the gold mineralization is structurally controlled and associated with much thicker zones of gold-rich quartz stockwork systems not previously identified or reported in historical documents. The detailed drone magnetometer and the IP surveys will play a pivotal role in following and identifying the horizontal and lateral extent of the known high-grade stockwork systems under the overburden covered Laguna gold mine trend. With this phase one geophysical data, we will be one step closer to our first drill program on the Laguna gold mine trend and the first on this trend in over 70 years." A total of 1,116 kilometres of tightly spaced lines between 25 metres and 50 metres spacing has commenced at the Property by A.I.R. Inc. from Flin Flon, Manitoba. The Unmanned Aerial Vehicle (UAV) used is a state-of-the-art Canadian designed and built helicopter style UAV which slings a potassium magnetic sensor underneath. Helicopters offer many advantages over other kinds of UAVs: Vertical Take-off and Launch, highest aerodynamic efficiency in forward flight as well as the best size vs payload vs flight time available. A GPS guided autopilot coupled with ground elevation data allows it to fly accurate survey lines that hug the terrain. With the implementation of a UAV over conventional ground and airborne surveys, one can now economically fly extremely tightly spaced lines with high density ground sampling distances without the need for line cutting. It is now possible to resolve individual magnetic anomalies that were previously indistinguishable when surveyed using conventional ground and airborne surveys, a perfect solution for structurally controlled gold exploration targets like that at the Property. Ultimately, magnetic surveys done from a UAV deliver higher quality magnetic data at a decreased cost with a reduced environmental footprint. Geophysique TMC, who have a long history of providing high quality field surveys to their clients, was awarded the IP contract. The initial ground geophysical surveys will consist of 65 kilometers of Gradient IP. IP and resistivity surveys are a useful tool in gold exploration to map resistivity and chargeability distributions and also to assist in general geologic mapping of lithology, structure and alteration along favourable horizons. The Gradient profiling technique has been selected here due to its good signal-to-noise, improved survey economics, and because of the capacity for good lateral resolution and depth penetration. Pole-dipole detailed surveys will be conducted over the highest priority target areas for additional detailing, with 3D inversions performed on both datasets. The Property hosts the Laguna gold mine, a high-grade former gold mine in the Flin Flon-Snow Lake mining camp. Historical, intermittent gold mining from the Laguna vein between 1916 and 1939 produced over 60,000 ounces of gold grading 18.7g/t. The Laguna gold mine infrastructure consists of a three compartment vertical shaft to 381 metres and 8 levels totalling over 3.0 kilometres of underground drift and stope development. The Property now includes 34 contiguous mining claims totalling 3,499 hectares covering 6.0 kilometres of prospective strike length of the Laguna gold mine trend. The Property is strategically located 20 kilometres from a 2,150 tonne per day gold mill facility in Snow Lake, Manitoba. The gold mineralization on the Property is metallogenically controlled by subsidiary thrust faults attributed to the major Crowduck Bay Fault which crosses the entire length of the Property a distance of 6.0 kilometres. The gold-rich quartz veining and stockwork systems along the northwest limb of the Herb Lake Syncline typically occur where the subsidiary faults intersect quartz-feldspar and biotite porphryry stocks that intrude Missi Group sedimentary and volcanic rocks. Quartz-iron carbonate-albite-sericite alteration commonly overprint peak regional metamorphic assemblages within auriferous vein margins. Mineralization in quartz and surrounding quartz stockwork wall rock consists of pyrite, arsenopyrite, chalcopyrite, sphalerite, galena, pyrrhotite, native gold and telluride. Typical gangue minerals include tourmaline and fuchsite. Pursuant to its option agreement Rockcliff can earn a 100% interest in the Property. Please refer to the news release dated September 12, 2016 for specific terms of the option agreement. In its annual survey of exploration and mining companies, The Fraser Institute survey found that Manitoba is ranked as the second best jurisdiction in the world for exploration, mining and investment attractiveness. Manitoba historically has been rated as a top tier investment location on an annual basis and continues to provide an excellent location for Rockcliff to invest and discover deposits in a mining friendly jurisdiction. Rockcliff is a Canadian resource exploration company focused on the discovery, advancement and consolidation of the highest grade unmined metal deposits in the prolific Flin Flon - Snow Lake (FF-SL) greenstone belt specifically centered on Snow Lake, MB. The Snow Lake Project, totalling in excess of 45,000 collective hectares is located in and around the Snow Lake mining camp and hosts the highest grade unmined NI 43-101 copper deposits (the gold-rich Talbot copper deposit and the Rail copper deposit), the highest grade unmined historical zinc deposits (the Lon zinc deposit, the Bur zinc deposit, the Morgan zinc deposit and the down dip continuation of the Pen zinc deposit). The Snow Lake Project also includes a high grade former lode gold producer (Laguna gold property), a Net Smelter Royalty (NSR) on the Tower property (the T-1 copper deposit) in the FF-SL greenstone belt and the near surface MacBride zinc deposit located north of Snow Lake near Leaf Rapids, Manitoba. Additionally, Rockcliff owns a zinc-silver rich NI 43-101 Resource (the Shihan deposit) in Ontario and a royalty on two gold properties in Colombia, South America.